A Positioning Matrix refers to a graphical tool for visualizing the position of a product or service within the context of the overall market for similar products and services. That is to say, it helps to present the position of a target product or service, compared with other products or services in the same market. A typical position matrix is made up of four squares and two labeled axes. Names of products and services are put in the squares and the distance of products or services from the attributes marked on the axes show the relationship between them and the attributes. The larger the distance is, the weaker the relationship is. The far end of the axis means the extreme opposite along its attribute. Sometimes, bubble shapes are used to represent different brands, with the size indicating market share. A Positioning Matrix is typically used to help show or explain a new product or service offered to investors and customers. It is quite useful for defining the market that the product or service intends to serve and helping emphasize the differences between the target product and other competitors. In this way, unmet needs can also be found out. Position matrices are often used as tools to assist in the task of product and service distinction, too, a step component of the marketing process. 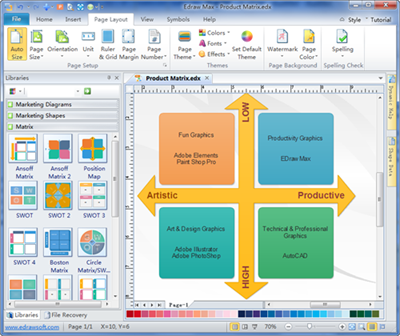 Edraw members have always been striving to bring benefits to users, particularly to offer more types of templates and examples in order for any level of users to made matrices better and faster. Therefore, even though you know nothing about position matrix, you do not have to start from zero. Just follow these simple steps. 2. 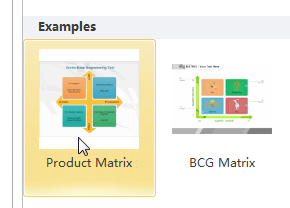 Move the pointer downwards to the Example list and double click on the Product Matrix example to open it. 3. 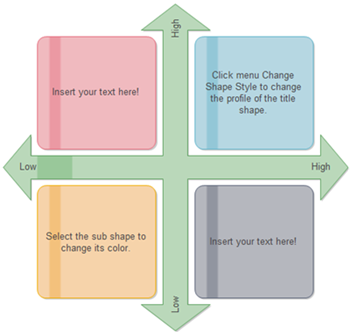 Replace the text in the diagram according to your need. 4. Save or export the diagram as you wish. To see the usefulness of examples of this solution, check it out on this page. We recommend 5 steps to check and refine your result by deciphering its strong and weak points. It is extracted as 5C's checklist, namely, clarity, completeness, cohesiveness, competitiveness and choice-fullness. Clear- Make sure the language is capable of being understood Complete - Ensure that it contains all essential factors and parts. Competitive - Be sure to express difference and create preference. Cohesive - Be certain that all parts are well-connected as a whole. Choice-full - It is single-minded; not all things for all people.